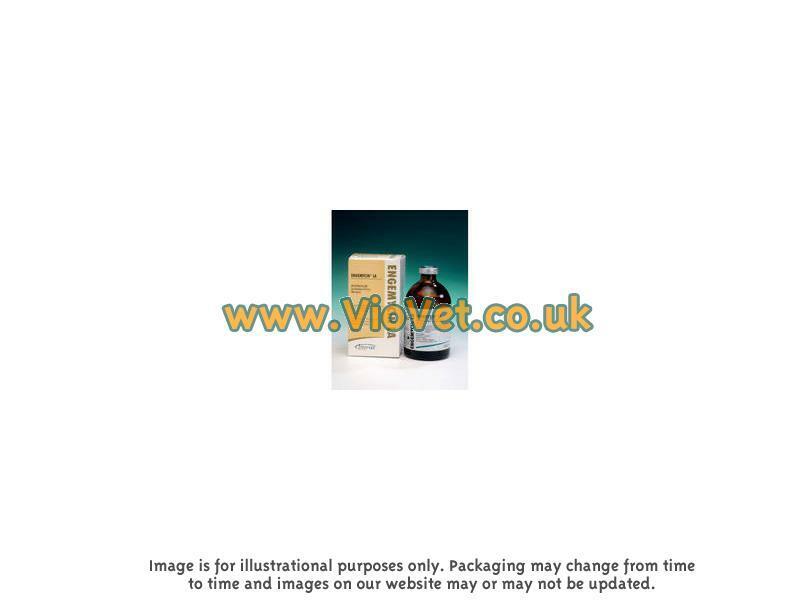 Engemycin can be purchased from VioVet at fantastic prices. 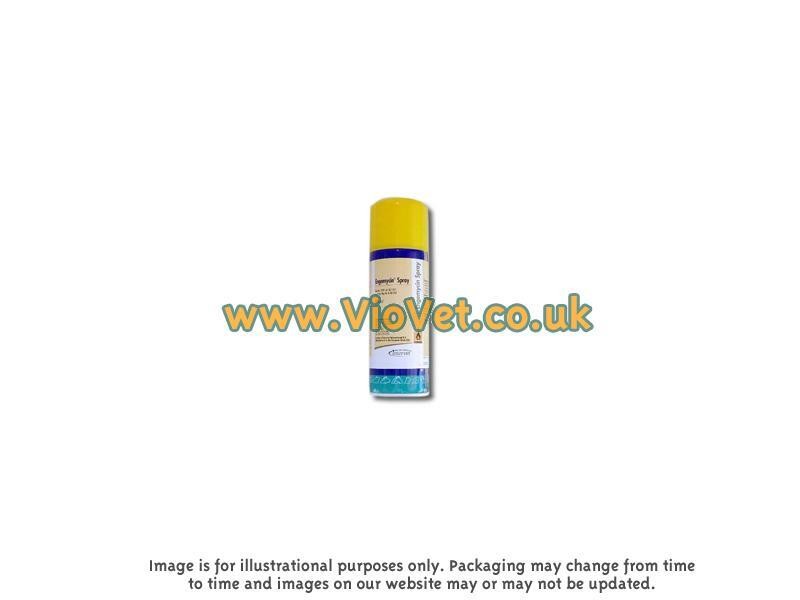 With free delivery on most orders and a wide range of products available, you can buy with confidence from VioVet! A clear, yellow aqueous solution for injection containing 100 mg per ml of oxytetracycline (as the hydrochloride). Antioxidant sodium formaldehyde sulphoxylate 5mg per ml. The treatment of infections caused by organisms sensitive to oxytetracycline in horses, cattle, sheep, pigs, dogs and cats. In vitro, oxytetracycline is active against a range of both Gram-positive and Gram-negative microorganisms including: Streptococcus spp., Staphylococcus spp., Listeria monocytogenes, Mannheimia haemolytica, Haemophilus parahaemolyticus, Bordetella bronchiseptica, and against Chlamydophila abortus (formerly Chlamydia psittaci), the causative organism of enzootic abortion in sheep. DD=Dual Dosage. Engemycin 10% (DD) can be administered either at a low dose rate for a 24 hour duration of activity or at a high dose rate for prolonged duration of activity. The recommended dosage rate is 3–10 mg/kg bodyweight (depending on age and species – see table), by intramuscular or intravenous injection in large animals, subcutaneous or intramuscular injection in small animals. The treatment may be repeated at 24 hour intervals up to 4 times (5 treatments in all). Intravenous injections must be given slowly over a period of at least one minute. 10 or 20 mg/kg bodyweight depending on age and species (see table) by intramuscular injection only, repeated once after 48–60 hours if required. This dosage regime is not advised for use in horses, dogs or cats. 20 mg/kg administered about day 95–100 of gestation. A further treatment may be given 2–3 weeks later. Before administration, clean the area of the injection site and swab with spirit. Maximum recommended dose at any one site: 20 ml for cattle, 10 ml for sheep and pigs. Repeat doses should be administered at different sites, and the sites massaged well after injection. Do not administer to horses during concomitant therapy with corticosteroids. A transient swelling may be observed following intramuscular administration in horses and subcutaneous administration in dogs. The use of tetracyclines during the period of tooth and bone development, including late pregnancy, may lead to discolouration. Photodermatitis may occur after treatment if exposure to intense sunlight occurs. Not for intravenous administration in dogs or cats. It is not recommended to administer bacteriostatic and bactericidal antimicrobials concurrently. Overdose: Oxytetracyline has low toxicity, but is irritant. Overdosage should be avoided, particularly in horses. No recommended treatment. Take care to avoid accidental injection. In case of contact with eyes or skin, wash immediately with plenty of water as irritation may occur. Animals must not be slaughtered for human consumption during treatment. Animals may be slaughtered for human consumption after the number of days stated below. Milk for human consumption must not be taken during treatment. Milk for human consumption may be taken from cows after the number of days stated below. Not for use in horses for human consumption. Do not store above 25 °C. Protect from light. Do not freeze. Keep container in outer carton. Dilution with calcium salts is not recommended as this may lead to precipitation of crystals. Glass bottles or polyethylene terephthalate (PET) bottles containing 100 ml. This product has been specifically formulated to reduce pain on injection without the need for addition of a local anaesthetic. As with other tetracyclines, caution should be exercised in treating horses under stress. Exercise caution in animals with renal or hepatic impairment. A sterile aqueous solution containing Oxytetracycline Dihydrate equivalent to 200 mg/ml Oxytetracycline base. Sodium Formaldehyde Sulphoxylate 4 mg/ml as an antimicrobial preservative. Engemycin LA is specifically formulated to provide a prolonged action resulting in sustained antibacterial activity. Blood levels persist for at least 4 days. After administration by the intramuscular route maximum blood levels are achieved after 4 to 8 hours making Engemycin LA suitable for the treatment of acute infections. Oxytetracycline has shown to be effective in vitro against the following bacterial species. Bordetella bronchiseptica, Actinomyces pyogenes, Erysipelothrix rhusiopathiae, Escherichia coli, Haemophilus somnus, Mannheimia haemolytica, Pasteurella multocida, Salmonella dublin, Staphylococcus aureus, Streptococcus agalactiae, Streptococcus faecalis, Streptococcus pyogenes and Streptococcus uberis. Atrophic rhinitis caused by B. bronchiseptica, M. haemolytica and P. multocida. Navel/joint ill caused by A. pyogenes, E. coli and S. aureus. Mastitis caused by A. pyogenes, E. coli, S. aureus, S. agalactiae, or S. uberis. Metritis caused by E. coli or S. pyogenes. Pasteurellosis and infections of the respiratory tract caused by M. haemolytica and P. multocida. Septicaemia caused by S. dublin and S. pyogenes. Erysipelas caused by E. rhusiopathiae. 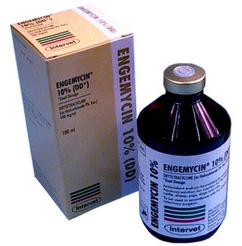 Engemycin LA can also be used in the control of enzootic abortion in sheep. An appropriately graduated syringe must be used to allow accurate administration of the required dose volume. This is particularly important for small doses. Wash hands after use. In case of contact with eyes or skin, wash immediately with water as irritation may occur. Milk for human consumption must not be taken during treatment. Milk for human consumption may be taken from cows after 240 hours (10 days) from the last treatment and milk from ewes may be taken after 168 hours (7 days) from the last treatment. Cattle may be slaughtered for human consumption only after 31 days from the last treatment. Pigs may be slaughtered for human consumption only after 18 days from the last treatment. Sheep may be slaughtered for human consumption only after 9 days from the last treatment. Do not store above 25 °C. Protect from light. Do not dilute Engemycin LA. Following withdrawal of the first dose use the product within 28 days. Keep container in outer carton. When the vial is broached and the contents exposed to air the solution may darken but the potency will be unchanged. If stored as directed, Engemycin LA can be expected to retain its potency for 2 years from the manufacture date. When the vial has been broached and the contents exposed to air, the solution may darken but the potency will be unchanged. There are currently no questions for Engemycin - be the first to ask one!